This listing consists of the camera and wall mount. Note cellphone is not included but the camera is compatible for viewing on iPhone and Android cellphones. Watch real-time video from anywhere, anytime! Imagine you're sitting in your office, suddenly you want to check in on your baby. 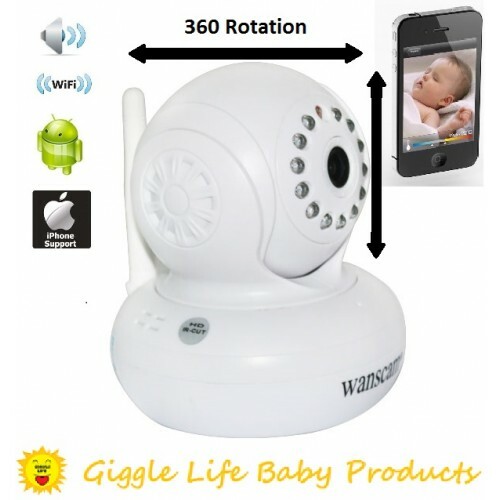 With this remote viewing baby monitor camera, you can check in on your baby at anytime and from anywhere in the world! You can scan the barcode on the camera with your iPhone, and then install the free app. Thus you can always check in on your baby, when you miss him or her. Sometimes you can snap a picture of baby's wonderful moment remotely! P2P (Free) No need to preset camera. Offer free P2P(JWEV-000xxx-xxxxx), Plug&play,.Support QR code scanning to view . PC client Install program to computer,view 16 cameras in LAN or from internet,recording,snapshot,2-way autio available,Multi-language.